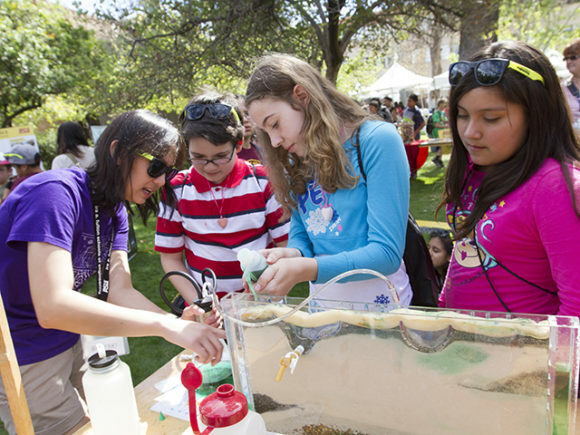 The wonders of flight, infrared cameras, 3-D printing, underwater robots and solar crickets came alive for elementary and middle-school children at the 2014 DiscoverE Day on Feb. 28. 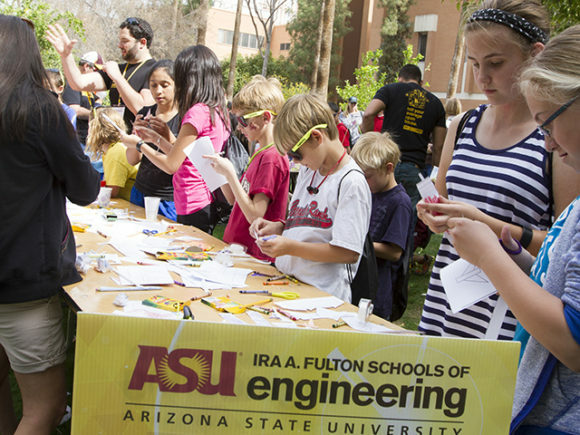 More than 1,100 students from about 20 schools attended the open house, sponsored by Arizona State University’s Ira A. Fulton Schools of Engineering. 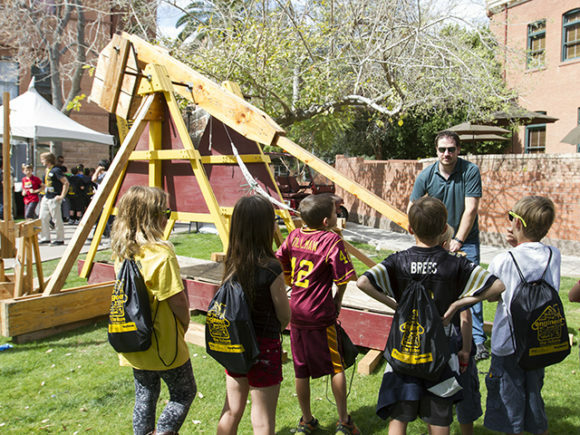 Displays ranging from a trebouchet modeled after those used on medieval battlefields to rockets that can fly into space were set up on the lawn next to the Virginia G. Piper Writers House on ASU’s Tempe campus and manned by engineering students and industry sponsors. Cutler scheduled a late bus pickup so her class of fifth- and sixth-grade honors math students also could tour Barrett, The Honors College, where her son, Ben Beechamp, a sophomore in mechanical engineering, is enrolled. 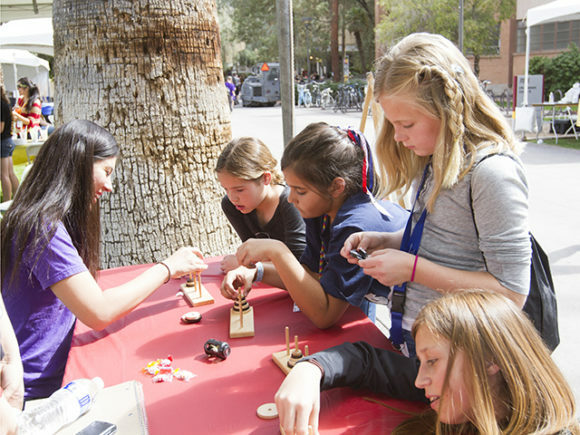 At one table, Alecia DePhillips, 13, a seventh-grader at Horizon Elementary School in Glendale, was tying a string around a rubber band and hooking it to a binder clip to make something that could pick up a cup. 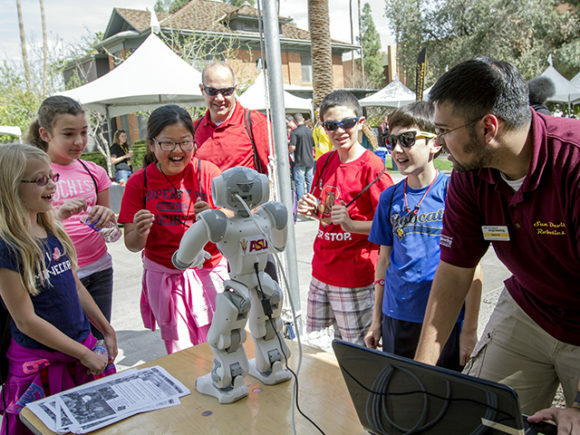 “We’re learning to make a robotic arm,” DePhillips said. 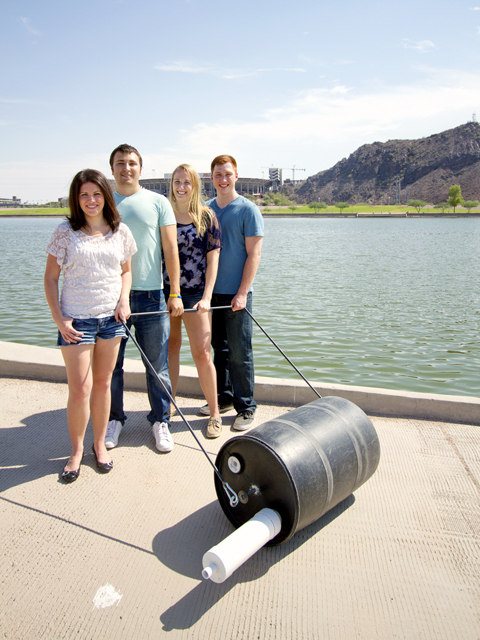 Catie Hoekstra, a freshman mechanical engineering major, encouraged DePhillips and her classmates to keep reinventing their inventions. “Looks like you need to change your design,” Hoekstra said. 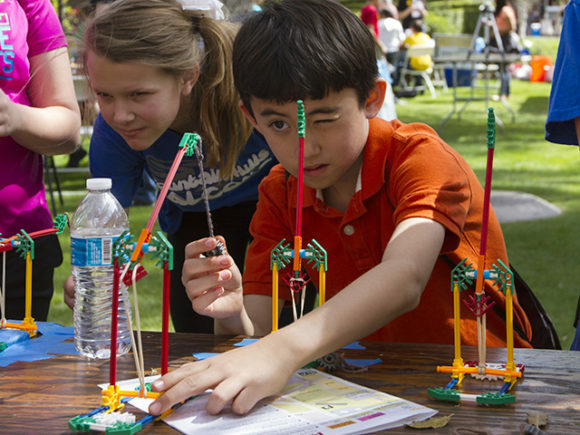 “A big part of the design process is trying different prototypes. You might have hundreds of iterations of a prototype before being successful. Nearby, students were trying not to crash an airplane in a flight simulator. Wood, whose father was a pilot, grew up around planes, and was an avionics technician on F/A-18 aircraft in the U.S. Marine Corps. He would like to design engines when he graduates. “Engine technology is changing so quickly,” he said. 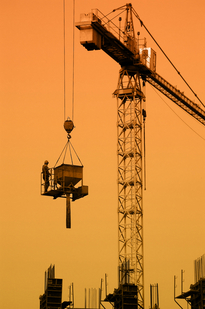 “Fuel efficiency is a big deal, especially on the commercial side. A hive of students buzzed around Joe Carpenter, a senior chemical engineer, who stood near the booth for the Quantum Energy and Sustainable Solar Technologies (QESST) group, holding a tray of clattering mechanical crickets, each with a tiny solar panel on its back. Slowly, Carpenter lowered the tray into the shade and the clattering stopped, eliciting oohs and ahhs from the students. 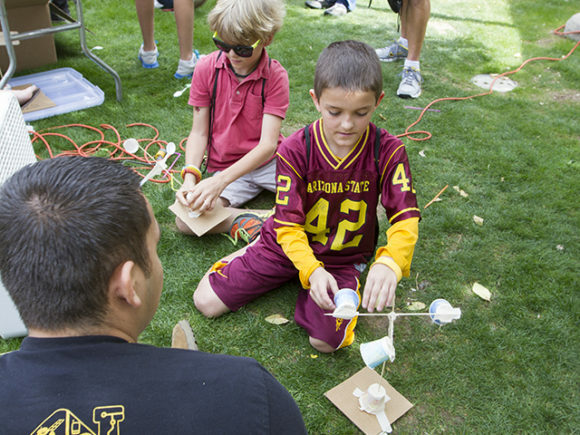 Tucker Ely, in the first year of a doctoral program at ASU’s School of Earth and Space Exploration, also manning the QESST booth, said exposure to college and engineering is important for the students. 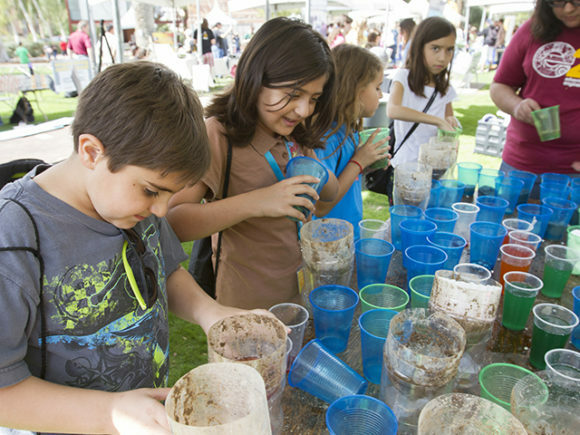 Ely, who earned his bachelor’s degree in evolution from the University of California, Santa Cruz, wants to run his own laboratory one day to explore the origins of life. Robert Espinoza, who is working on his master’s degree in bioengineering, showed students the process and outcome of 3-D printing. “We want them to see how you take something from the idea through design to make a viable medical product,” Espinoza said. Through his research, Espinoza helped produce a clothlike structure that is applied to a wound instead of sutures and promotes faster healing. “The students coming behind me are taking it to another level,” said Espinoza, who wants to work in research and development, or possibly as a forensic scientist. Across the sidewalk, Cheyenne Harden, a master’s student, and Claire Antaya, a fourth-year doctoral student, showed students how to use an infrared camera to see which of several light bulbs was more energy efficient and which household appliances put off the least heat: a toaster, a radio, a space heater, or a dust buster vacuum. They also used wattmeters to see how much power each appliance used. 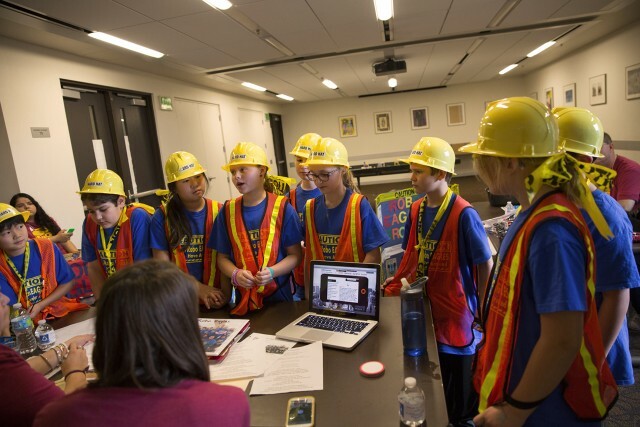 Both women said the open house was a good way for girls to get excited about engineering. “Girls don’t get enough encouragement at school or at home,” Antaya said. “Research shows us that females lose interest around the sixth grade. They don’t think they can do it anymore. Harden said that, up until high school, she thought an engineer was a train conductor. 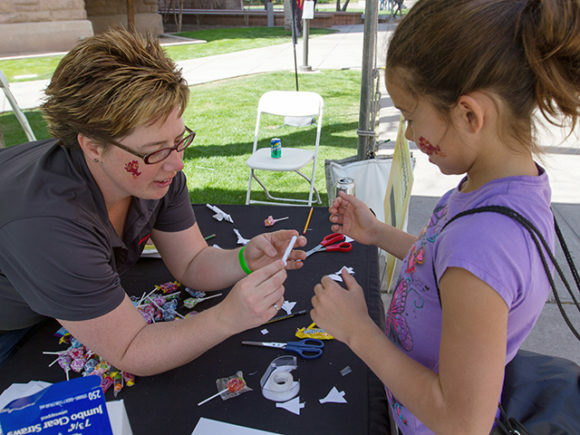 Sandy Abbott, who teaches gifted third- through fifth-graders at Cochise Elementary School in Scottsdale, said she saw many of her students blossom at the event. Giovanny Renteria, 11, a student from the Magnet Traditional School, said he has worked on cars with his dad, and wants to learn how to make them safer. “Engineering can help,” Renteria said.